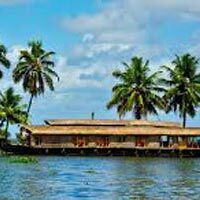 The tour begins with your arrival at the respective stations or airport at Kochi. From here you will be taken to Athirappilly, it is gifted with all the elegance of the nature. You will witness the most beautiful and largest waterfall in the whole state of Kerala. On reaching Athirapally, you check in at the hotel and the rest of the evening is at leisure in the comfort of the hotel. This place is embraced by dense forests which offer a wide range of flora and fauna. The waterfall is the most striking feature of the place and is even referred to as the Niagara Falls of India. The view of the falls will take your breath away; it falls with its full intensity making the water dance with each hit at the ground. Overnight stay in Athirappilly. After breakfast, you have a day planned out for sightseeing. Shortly you leave to visit the Thumburmuzhi Gardens, Vazhachal Forest Gardens, and waterfalls including the Charpa fall. The Vazhachal waterfalls are located very close to the Athirapally falls. After visit to these sites, the rest of the day is at leisure to explore the tribal villages, hiking or fishing. Overnight stay in Athirappilly.